We used our Bella Script to add the words "Attitude Chick" to the design. The set includes designs with the Attitude Chick words and you also receive just the chick by itself. If you have our Bella Script you can add a matching name! Isn't this a cute design for Spring? Perfect for clothing, burps, bibs - totes too! MATCHY MATCH ALERT! 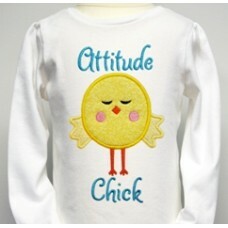 We offer a matching Fun Felt Snap Clip cover design for Attitude Chick. The link is in related products at bottom of the page!